Bring a pot of salted water to a boil and cook pasta as directed; reserve ¼ cup of the cooking liquid before draining pasta and setting aside. 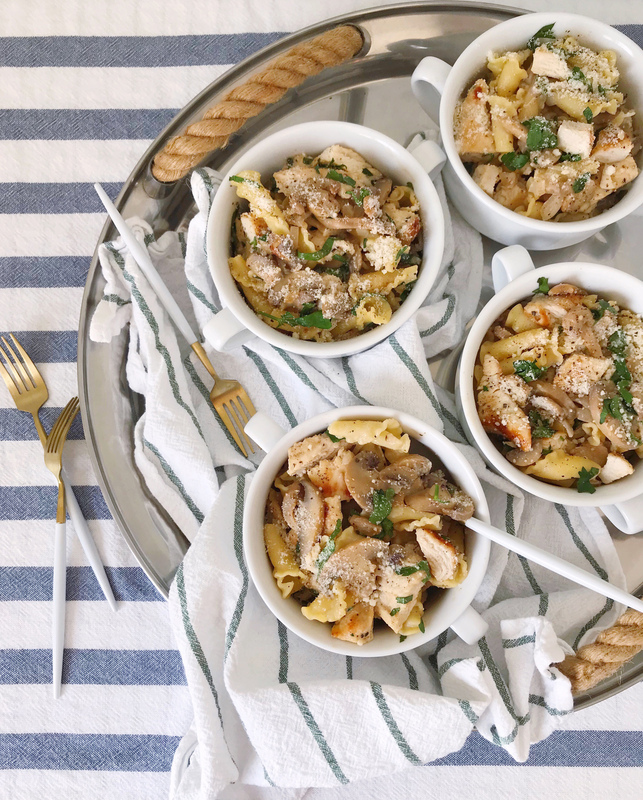 While the pasta cooks, pound the chicken breasts until they are an even thickness, about ¼”. Toss the chicken with a light dredge of flour and season with salt and pepper. In a large skillet, melt 2 tablespoons of butter and add chicken to the pan. Cook chicken through, turning once, about 6-7 minutes. Remove from the pan and set aside. Chop into bite-sized pieces after the chicken has rested for a few minutes. Add the remaining tablespoon of butter to the pan, and toss in thinly sliced shallots, minced garlic, and mushrooms (drained of any excess liquid). Cook for 3-4 minutes until shallots soften. Add Marsala wine to the hot pan, scraping up any bits from the bottom; then stir in the chicken broth and reserved pasta water. Cook for an additional 5 minutes, allowing the sauce to reduce. Remove the pan from the heat and stir in the heavy cream, and about half of the parmesan cheese and parsley. Turn the oven on to the broil setting. 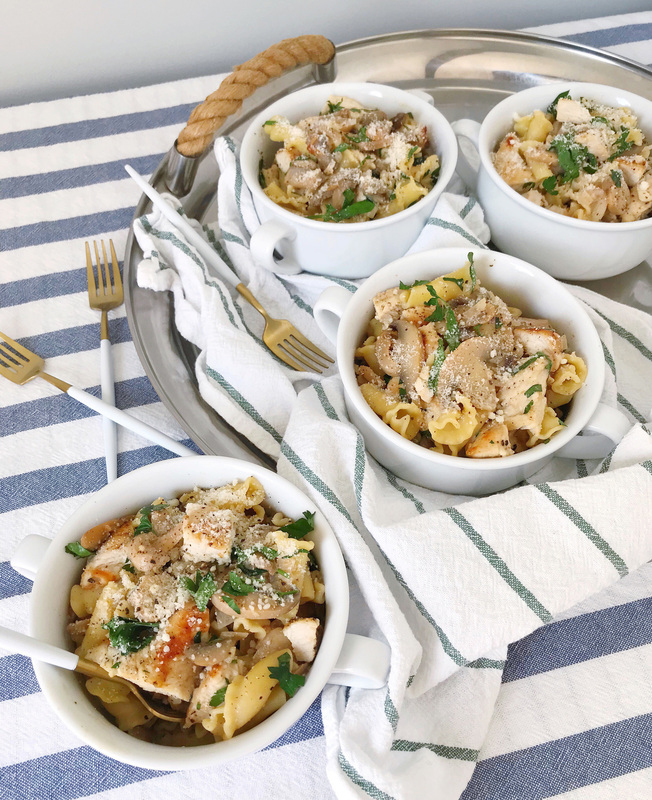 While the oven heats up, fold in chopped up chicken and cooked pasta, and then divide into 4 ovenproof bowls. Top each bowl with the remaining parmesan cheese and parsley, and set under the broiler for about 2 minutes, until the cheese begins to slightly brown. 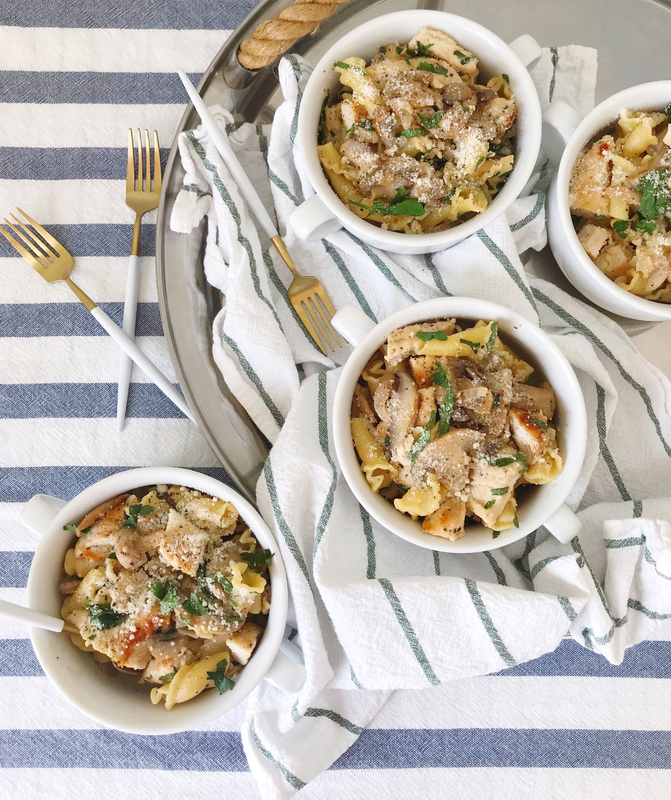 Serve immediately and garnish with additional cracked black pepper, parmesan, and parsley. One Response to "Chicken Marsala Pasta Bake."